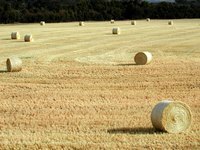 Any grass or other plant life that is cut green, dried and used as feed for livestock is hay. This plant life can consist of alfalfa, orchard grass, Timothy, clover or other grasses. There is no need to prepare the field every year if you choose the right crop. Alfalfa hay fields, for instance, can last up to seven years from one planting, but must be replanted every few years to keep other grasses from taking over your field. Field preparation will determine the bounty of your hay harvest. Contact your extension office to determine what types of hay grow best in your area. Remove all weeds and foliage from the field using your tractor. Clean your field so that your hay will not be overcome with weeds or other grasses. Dig soil samples from 15 to 20 locations throughout your field in the fall after your field has been harvested. Dig down using your soil probe or auger 6 to 8 inches and take a sample of soil. Mix the soil samples together in a bucket and allow the soil to dry. Do not dry the soil using artificial methods. Add 1½ to 2 cups of soil to the sample container provided by your soil testing lab or extension office. Send or take this sample in. The office will tell you how to amend your soil to the appropriate pH for the hay you wish to plant. Your soil needs a pH of about 6.5 or higher. Add in any amendments recommended by the sample lab and then plow your field thoroughly, ensuring that the soil is well-drained. Plow in two directions to ensure your entire field is plowed well. Work the soil over again with a mulcher after adding any manure, mulch or fertilizers. The seedbed should be firm before planting. Use a seeder to drill the seed into the soil to a depth of no deeper than 1/4 to 1/2 inch. Seed early in the spring, as soon as the ground thaws, to ensure multiple crops from your field during the growing season. Water the field thoroughly after seeding. Use pre-inoculated seeds to fight fungus and diseases that can take over your field.